Various reasons such as missing log files, low disk space, hardware failure, ransomware, license issues may bring your Exchange server down. It may lead significant business disruption and organizational communication. EdbMails EDB to PST converter tool recovers your corrupted or damaged EDB file and helps you to re-build your Exchange Server. EdbMails helps you with AES 256-bit encrypted Online Exchange and Office 365 incremental granular backup to protect your Exchange and Office 365 data from accidental deletion, losing total control and access. You can quickly restore individual Exchange and Office 365 tenants and files with simple and scalable backup. EdbMails hassle-free incremental, granular migration, helps you in direct Server to Server migration of your existing Exchange Server to Office 365 or to a new Exchange server. You can move all items both to an empty (new) Office 365 / Exchange tenants or to an existing organization, this helps during company mergers or acquisitions. EDB to PST Converter. EDB to Office 365. EDB to Live Exchange Server. Live Exchange Server (2007, 2010, 2013, 2016) Backup, AES 256-bit Encrypted, True Incremental. Performs a very smooth recovery from a corrupted, damaged, inaccessible or healthy EDB files in all conditions. EdbMails EDB file recovery extracts the Mailbox folders and Public folders keeping the original folder structure intact from the source EDB file. It recovers the deleted mailboxes and its items which you think are lost permanently. Recover accidentally deleted mailboxes from EDB File. Open Exchange Database file or EDB file from where the deleted emails are to be recovered. You can find the deleted items in 'Recoverable Items' folder and 'Deletions' folder for each user mailbox. You can easily split large PST files into smaller with the help of EdbMails application by setting PST split size during EDB to PST conversion. Or leave the settings to default to export the entire mailbox to a single PST file. EdbMails ease-of-use interface will make your Public folders recovery simple. You just need to browse the Public fodler EDB file and EdbMails will handle the rest. On Export EdbMails will automatically creates separate PST files for each Public folders. In addition, EdbMails supports Priv EDB files export and migration. 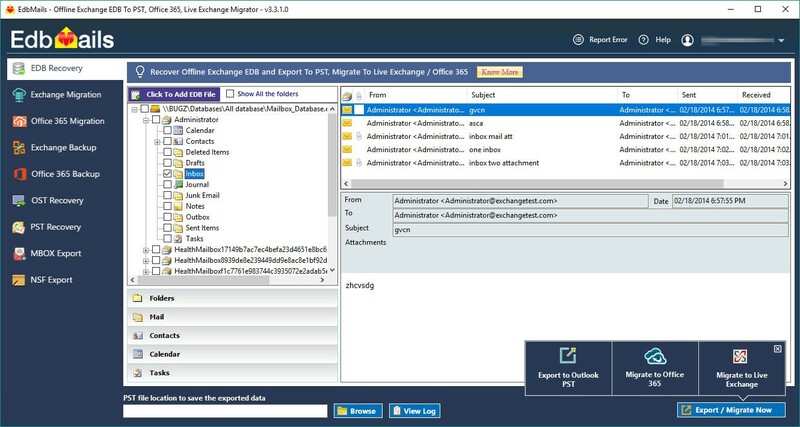 EdbMails direct Public folders to Office 365 / Live Exchange server migration will ease your job in migrating Calendars, Contacts etc., items from the Public folders. EdbMails is versatile enough to migrate multiple mailboxes directly from EDB to Office 365 / Live Exchange server. Allows you to map the EDB Mailboxes to the corresponding Live Exchange / Office 365 tenants accurately. You can perform direct EDB to Office 365 / Live Exchange server migration without the need of EDB to PST conversion. 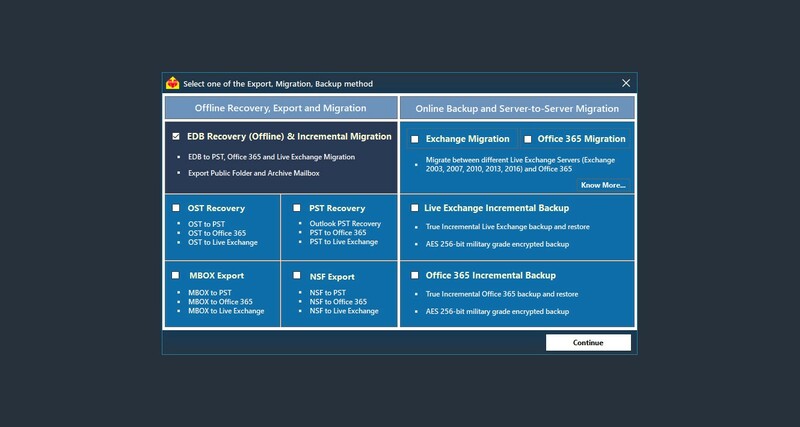 A true Incremental migration of EDB file to Office 365 / Live Exchange server will avoid creation of duplicate items in any forms on your server during consecutive migration. EdbMails is designed to handle migration of single mailboxes to large size multiple mailboxes in one go. Incremental migration will save time and bandwidth by only migrating the newly added items from the last migration. This will improve the overall migration performance and your migration job will be hassle free. Migrate Live Exchange server user mailbox, public folders, Archive Mailbox, shared Mailboxes to other Live Exchange server. With the help of EdbMails Live Exchange migration, you can easily map each user to corresponding Exchange mailboxes on target Exchange server. View the migration report with the details of the Migration and count of each item for every folder being migrated. EdbMails ensures that there is no change in the data at the source server. All the credentials entered during migration operation are encrypted and used only to achieve the migration goals. EdbMails guarantees zero downtime. Your current exchange deployment will be up and running and completely usable during the entire migration process. EdbMails lets you run an incremental migration to migrate new items of the source to the target server. This saves Migration time and space on target server. Migration all your on-premise Live Exchange mailboxes to Office 365 with ease. EdbMails supports Office 365 migration from Exchange 2003, 2007, 2010, 2013 and 2016. Create a public folder in the office 365, assign it to a user and choose the assigned user in EdbMails wizard and rest will be taken care of automatically by the utility. EdbMails can accomplish Migration between Office 365 tenant to newly created Office 365 tenant or even to an existing tenant. Whether it is emails, calendars, tasks, notes, journals or contacts - everything that is present in your source server will be moved to the target server in the same hierarchy. EdbMails application performs incremental migration also known as a delta migration to migrate only the new/changed items, saving migration time and space on target server. Granular recovery allows backup or restoring only required folder/items of the mailboxes. EdbMails allows you to backup of specific data from the Exchange server. Ensure no need of full backup which is time-consuming. An incremental backup is one in which successive backup of the Exchange server mailbox items contain only the portion that has changed since the preceding backup copy was made. When a full recovery is needed, the restoration process would need the last full backup. All the backups done using EdbMails are securely with AES-256 bit military-grade encryption to ensure maximum security. Every individual backup file no matter how big or small it maybe, is secured through AES-256 bit Encryption Standard. This minimizes the risk of unauthorized access to your backup data. Never have to worry about retention policy changes. With secure backups made with EdbMails you can be sure that all your data is safe and can be restored at anytime irrespective whatever changes have been made to the retention period. EdbMails doesn't disturb any of the regular Exchange server functions or interrupt the users from accessing their mailboxes as it runs in background maintaining direct connection to the exchange server. Have peace of mind that none of your mails, contacts, calendars or other information will ever be lost, thanks to public folder backup by EdbMails. You can easily backup the Public folder of your organization to local drive and access it in any disaster recovery. Take full/incremental backup of your Office 365 user accounts, public folders, Archive Mailbox, shared Mailbox and save them to local storage. Keep the backup files as long as you need and restore them effortlessly in any disaster recovery. Store your backup data as long as you need. EdbMails Backup for Office 365 saves backup copies to your local storages, you don't have to worry about the retention policy anymore. Manage all user mailbox and public folders backup copies from one place. Create backup jobs for the entire Office 365 tenant or selected mailboxes and/or public folders. Let the application perform one-time full backup and then continuous incremental backups of your Office mailboxes / public folders to keep the data upto date. No need to maintain licenses for those users/employees that are no longer a part of the firm in order to retain their data. With EdbMails you can easily backup the required user data and cancel the Office 365 license. 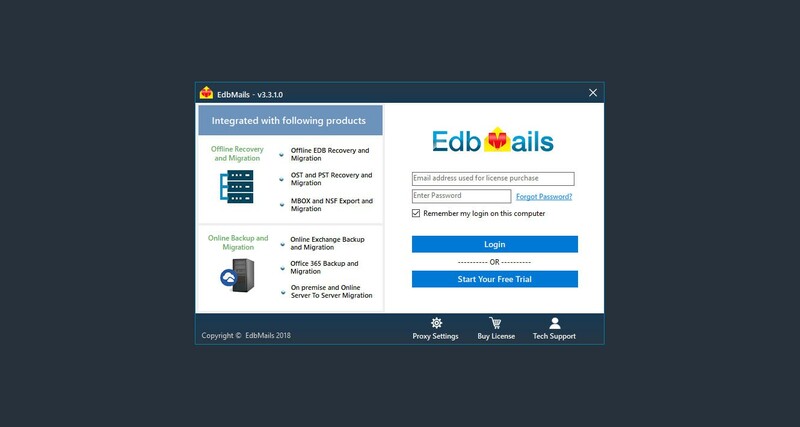 With EdbMails you won't have to worry about any intermittent internet connection issues as it Reconnects automatically and progress the backup. Use EdbMails OST to PST converter tool to recover the corrupted / orphaned OST file and import the extracted PST file in Exchange server using Powershell. EdbMails Free OST viewer: you can preview all the mail items, folders, contacts; calendar etc and verify the OST file data. Just give impersonation rights to one of the user of the office 365 or live exchange server and login via EdbMails. Map the OST file to corresponding office 365 or live Exchange server user for Migration. EdbMails doesn't have any restrictions on the size of OST file or the number of OST files that can be exported. EdbMails application performs incremental OST file migration also known as a delta migration to migrate only the new/changed items, saving migration time and space on target server. Export OST file to PST and have it backed up regularly. In case of Exchange Server crash, you will be able to restore the mailbox data. Export all your mailboxes from corrupt or inaccessible Outlook PST files to a new PST file flawlessly using EdbMails. Open the PST file in outlook or import to Exchange server using Powershell. EdbMails for Outlook PST recovery can effortlessly recover your emails, contacts, events, calendars etc. from the PST file along with all email properties such as cc, bcc, from address, to address, subject etc. Just give impersonation rights to one of the user of the office 365 or live exchange server and login via EdbMails. 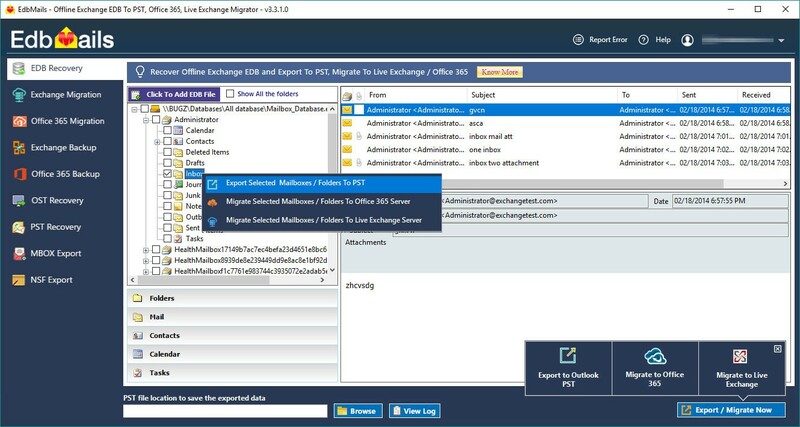 Map the PST file to corresponding office 365 or live Exchange server user for Migration. EdbMails application performs incremental PST file migration also known as a delta migration to migrate only the new/changed items, saving migration time and space on target server. You can selectively export required items such as folders, contacts, Calendars etc. Also you can filter the export based on send address, date, attachment names etc. Using Outlook PST repair tool you can split a single PST to multiple small sized PST files automatically or export your Mailbox to a single PST file. Use EdbMails to Convert Mbox to PST quickly and efficiently. Open the PST file in outlook or import to Exchange server using Powershell. Just give impersonation rights to one of the user of the office 365 or live exchange server and login via EdbMails. Map the MBOX file to corresponding office 365 or live Exchange server user for Migration. The Mbox to PST tool shows you a full preview of all the Mbox contents with just a few clicks, you can access all the mail items within Mbox file. EdbMails guarantees that all the data from your MBOX file is exported to PST without anything being left out but also ensures that there is no alteration to the original Mbox file. With the help of EdbMails MBOX to PST Converter, you can filter the export based on send address, date, attachment names etc. EdbMails supports converting Google vault (Gmail addon) Mbox files to Outlook PST and also has support for mails archived as Mbox files using google takeout. Effortlessly Convert IBM lotus notes NSF to PST using EdbMails without any data loss. Open the PST file in outlook or import to Exchange server using Powershell. The NSF to PST Converter utility also allows for viewing of all the NSF mailboxes and folders along with preview of each item in EdbMails. EdbMails requires Lotus Notes client to be installed on the system for NSF to PST export, NSF to Office 365 or Live Exchange Server migration. EdbMails allows you to export selective data during EDB to PST export. You can easily select the required mailboxes and its folders from the Tree View and export. The granular Exchange Server Recovery support will enables you to export only the required folders and its items to PST file. You can archive Live Exchange / Office 365 mailboxes to PST using EdbMails. Having PST archive copies is extremely useful when your employees are out of office. And to manage email copies for litigation / legal requirement. EdbMails for EDB to PST Conversion has a versatile and easy to use interface that is self-explanatory. With just a few clicks, you can extract pst from edb file using EdbMails. No running Exchange Server Services or log files are required for EDB recovery with EdbMails. Apart from retrieving data from corrupted offline Exchange Server database EDB file, you can directly migrate EDB to Live Exchange Server or Office 365 or hosted Exchange Server. You can migrate between Exchange Server versions, Office 365 tenants or from Exchange Server to Office 365 and vice versa. Thus, EdbMails is a complete solution for all your Exchange recovery as well as migration needs. EdbMails application efficiently recovers all intentionally or accidentally deleted mailboxes. EdbMails recover restores the complete mailbox items, making sure users don't have to face mailbox missing or inaccessibility. EdbMails comes with simple and user-friendly user interface to perform an effortless EDB to PST conversion. There by your exchange server will be recovered and available for the production directly. It supports quick EDB to PST conversion for Exchange Server Recovery in a few clicks. The EDB to PST Converter application is consistent and simple. Effortlessly supports all Exchange Server version from Exchange 2003, 2007, 2010, 2016 and 2019. It doesn't create any difficulty during recovery and extraction. Step - 3: Preview and select the mailboxes to export EDB to PST. Step - 4: Export selected mailboxes or folders to PST. Why should I convert EDB to PST? Can I convert PUB.edb to PST? Yes. You can convert PUB.edb file to PST. Also, you can migrate the PUB EDB file to Office 365 and to Live Exchange server directly. How do I repair damaged Exchange server EDB file by using EDB Recovery Software? Open EdbMails application for Exchange EDB recovery. Browse your damaged EDB file from 'Offline Exchange Recovery' option. Application loads all the recoverable mailboxes in a tree view with folder structure in left side pane. Select all or single mailbox you wish to recover. Click the 'Browse' button to save the PST files in the desired location and click 'OK' button. Click the 'Export to Outlook PST' and proceed. During the export operation, detailed real-time progress will be displayed. 'Export operation has been completed' will be prompted and the newly created PST files can be found in the destination location. Application scans damaged EDB file and loads all the recovered mailboxes in the tree view on left side pane. Expand and click on any mailbox folder to preview its items. Do EdbMails impose item size or speed limits for Office 365 backup performance? Do you provide the guarantee of EDB to PST conversion? 1. Free Trial version to verify the export and migration of your EDB file, prior to purchase the license. 2. EdbMails guarantees money Back within 30 days of its purchase. We are happy to assist you on your Exchange Server recovery and migration. 100% of our customers are happy with our products and services. We provide Support for our customers 24*7 through Live Chat, Email and Phone for free of cost. We often update our products with enhanced features to fulfil our customer needs. “ I was looking for Exchange 2007 to Office 365 migration tool. I had tried to move from Exchange 2007 to cloud Office 365 using EdbMails software. EdbMails worked great and it helped me a lot in Exchange Server to Office 365 migration. “ Having used EDBmails EDB to PST on numerous occasions I have always had success with recovering the data I needed. “ I must say, your responsiveness and effectiveness is VERY IMPRESSIVE. My expectations were well exceeded by your brilliant EdbMails Exchange Server recovery service. “ I've used EdbMails for Exchange Server Recovery, which worked very well for exporting directly from .edb Exchange databases to standalone .pst files. Great for recovery. The team behind this project is very friendly and ready to walk the extra miles to fix any issue you have with installation or extraction. They helped me to retrieve a pst file from a backup EDB without using any exchange server. I was extremely pleased how they handled any small problem and they did not rest until the job was done. “ Just to let you know that the exports to PST are going great. I have done about 30 mailboxes now and the largest so far is a 50GB PST. Great software. “ Amazing PST file repair software to recover confidential emails from corrupt Outlook PST File. This software is proved to be secure and free. Big thanks to the EdbMails Experts. “I have used the EdbMails to recover and migrate my Exchange EDB file to Office 365. “ Your support is very hot. Good going. Thank you. “ I have tried several software for migrating Exchange, and your seems a nice solution. 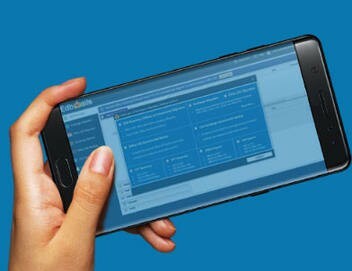 “ Lamentably, only couple of days back, I had lost all my association mails alongside considerable rundown of contacts and Recently I have used EdbMails EDB to PST Converter Software and it really worked like a pearl. “ This product recouped nearly everything which we had lost when our Exchange Server got slammed. Great product. I like your software, it's easy working and simple. “ I bought your software and it is really easy, it has perfectly exported my client's old Exchange 2010 to Office 365, Thank you EdbMails Team! *Free tool will support 30 items export / migration from each and every mailboxes / folders.